Ifan Michael’s Foreigner’s God has been on the film radar since March 2018, with the release of teasers and flower-tinged character posters that you can smell the lavender, and the recruitment of half of Nollywood. The star power of the movie is dizzying and staggering and on its way to be the most star-bloated Nollywood movie of all time. If you aren’t familiar with the cast, here you go: Onyeka Onwenu, Pete Edochie, Clarion Chukwurah, Sharon Ooja, Toyin Abraham, Annie Idibia, Ini Dima-Okojie, BamBam, Teddy A, Melvin Oduah, Toke Makinwa,Kemi Lala Akindoju, Sam Dede, Frank Donga, Linda Osifo, Kyle Colton, Mel Chude, Yinka Pearce-Tijani, Fletcher Harrington. As it is, I won’t be surprised if another actor joins the cast ensemble. For Big Brother Naija stars Teddy A and BamBam, their involvement with the movie is akin to a symbiotic relationship. The movie would siphon their newly acquired celebrity fame for its marketing, while the star couple would plug into the project to transact their status into money. Media personality, author and fashion entrepreneur Toke Makinwa was the last big announcement to join the overstuffed cast, and it will be her debut appearance in a Nollywood movie. Makinwa is at the epicenter of our cultural and media space, loved and hated in equal measure so much so that her social media missives is internet fuel. 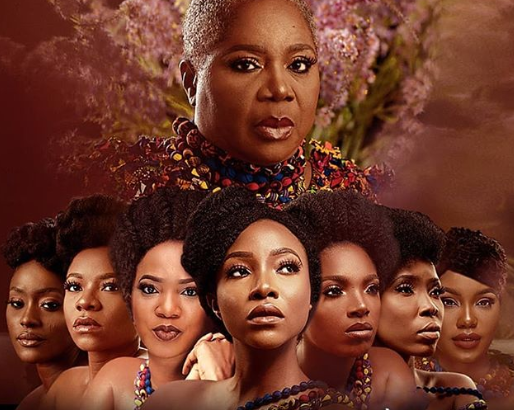 Onyeka Onwenu and Pete Edochie are fresh off from starring in Genevieve Nnaji’s buzzy directorial debut Lionheart, both of them huge, bankable actors who can give life to a mediocre script. Sharon Ooja, Lala Akindoju, Ini Dima-Okojie and Linda Osifo belong to a glossy, glamorous Nollywood, who cut their teeth on smaller projects and stage plays and will all be pivotal to the growth of the industry. Sam Dede of the Isakaba fame, sure why not? Queen Mother of ratchet comedy Toyin Abraham is a star-studded movie magnet, she can’t help it. Frank Donga…well, no surprise. Annie Idibia has no business acting because I can’t recall any movie she’s starred in. But she’s famous and that will do. Melvin Oduah…resurrected from where now? I don’t know, but the horrible memory of the Kupe Challenge with Tobi Bakre and Kenneth Okolie is fresh. 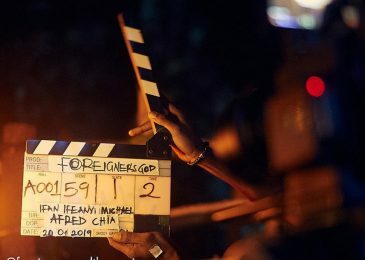 The shooting of Foreigner’s God started in December 2018, took a break for the holidays and now shooting has resumed in Enugu. Due for release this year, I’m more interested in how the movie will harness the allure of its star power and not be a disaster. Put bluntly, having so much stars in a movie doesn’t mean it will be good or successful. In fact, far from it. But we are currently witnessing a trend in the film landscape where studios and production companies are enlisting the biggest stars into movies, from comedy and music. The osmosis between these industries is proving that anyone can easily be imported into Nollywood. Foreigner’s God feels like one of those movies that either will be good or really bad. And I guess will we find when it gets released.